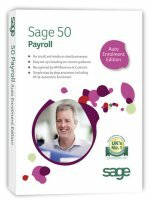 The latest version of the Sage 50 Payroll software range is the Auto Enrolment Edition and it introduces many new features and improvements some of which can be seen in the short video clips. So what is Auto Enrolment? Find out more about new HMRC legislation with this simple introduction to Auto Enrolment video and then order your Sage Auto Enrolment payroll software and training from Site4, your Sage Accountant Partner. Find out more about new HMRC legislation with this simple Real Time Information video and then order your Sage software and training with Site4, your Sage Accountant Partner.